This Sunriver vacation rental is located just a short 3 minute walk from the SHARC (Sunriver Homeowners Aquatic & Recreation Center). Rental of our home always includes UNLIMITED-USE passes to SHARC. 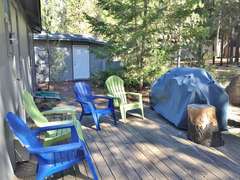 This tastefully decorated and comfortable, 1100 square foot home has a hot tub and bikes. The home is a three minute walk from the village mall where you will find shopping, entertainment, restaurants, day spas, and fitness center. Furnishings, decor, bathrooms, are recently updated. This traditional Sunriver cabin is warm and cozy in the winter and shaded in the summer. The home is single level with two bedrooms and two bathrooms. The master bedroom has a king bed and private bath. The second bedroom has a queen bed as well as bunk beds that share the bathroom in the hall. In the living room is a new queen sofa sleeper with a memory foam mattress. 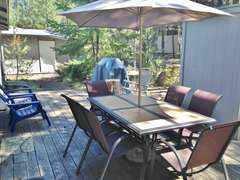 A private hot tub and deck with BBQ and comfortable patio furniture, with umbrella, allow you to relax and enjoy the outdoors. There are four adult bikes, as well as a 2-child bike trailer to explore the miles of paved bike trails throughout Sunriver. This home does not have A/C!